One of my favourite things about blogging in general is coming across brand new authors and finding a little gem and this book is more than a gem, it is a little diamond. This book is full of my favourite things…”feels,” this book makes you feel a lot. It is emotional, it is angsty, it is sad in places but it is so adorable, you cannot help but fall in love with the characters and the smattering of wit throughout the book balances it perfectly. I just absolutely loved it…hard!! For a debut author, Kathryn Andrews has nailed this one and it was a privilege to read such a beautiful and emotional story. 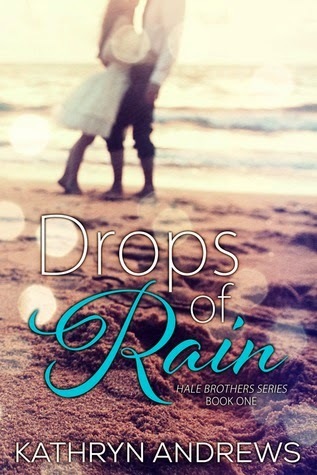 This is a story about Ali Rain and Drew Hale, but this is more than a story, this is a journey and one that will stay with me for a very long time. Ali Rain is overwhelmed with grief, not only is she still coping with the death of her mum, but she is also in a way dealing with losing her dad too. Her dad has shut down after the loss of his wife so Ali feels totally alone and to compound matters, in an effort to mitigate his grief her dad has moved them from their family home to Florida. Ali now has to deal with the loss of her friends and starting a new school on top of everything else. She really does feel abandoned; she is extremely sad and totally overwhelmed. But Ali does have inner strength and despite her inner turmoil she puts on a brave front. Her form of escapism is dancing, she is a very talented ballerina and she is also a runner to keep herself fit. It is while running on the beach she comes across Drew Hale, but will this be the only time their paths cross? Drew and Ali keep bumping into each other, turns out they are neighbours as well as both attending the same school. He has his early morning swims in the ocean and she runs along the beach, it is this routine that leads them to a friendship but Drew is determined not to get emotionally involved. He can’t afford attachments, he needs to escape but sometimes your heart and your head have different agendas. This is a story about young love, it is a powerful story and as I said extremely emotional. Both Ali and Drew are broken souls, Ali through her loss and Drew because…I am not going to say, you will just have to read it, but it is extremely sad. Drew has a lot of weight, guilt and burden on his shoulders, totally unfounded and unwarranted but he is that kind of person. He was a truly beautiful character, inside and out. Nothing could prepare Drew for the emotional relief that he would feel when he finally opened himself up, he took a huge chance with Ali, one that he wasn’t sure if he would come to regret, but with her and only her, he could finally be himself. He didn’t have to wear that mask, didn’t have to put up that front and he could finally just be Drew. This two really are each other’s soul mate, the development of their relationship was beautiful to read and really pulled at your heart strings. They have a lot of obstacles to overcome if they are to truly make a go of it, but with their foundations that they have slowly built I was eager for this couple to succeed. Life has many plans; I just hoped that “life” wouldn’t get in the way of true love. I have to mention Drew’s brother Beau, he was another amazing character and I cannot wait to read his book. His injection of wit and humour totally lightened up this book and his “brotherly” relationship too with Ali was endearing and heart-warming. Beau is Drew’s younger brother, but these two have a strong connection and again goes to show the true bonds a family have. In summary, I totally and utterly loved this book, I cannot recommend enough and Kathryn Andrews is definitely an author I will be watching avidly. For a first in series and a debut book, this book was fantastic. I was totally gripped from first to last page; I had tears of sadness and tears of laughter but most of all it was an emotional journey and one that I will not forget. My heart felt every word and that is no mean feat by any author. Well done Kathryn on an amazing story.